How Do You Spell BLINDLY? Correct spelling for the English word "blindly" is [blˈa͡ɪndlɪ], [blˈa‍ɪndlɪ], [b_l_ˈaɪ_n_d_l_ɪ]] (IPA phonetic alphabet). 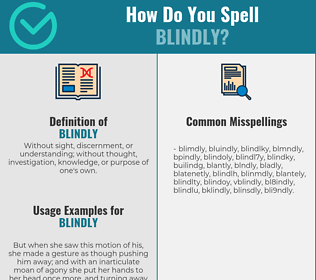 Below is the list of 199 misspellings for the word "blindly". Without sight, discernment, or understanding; without thought, investigation, knowledge, or purpose of one's own.